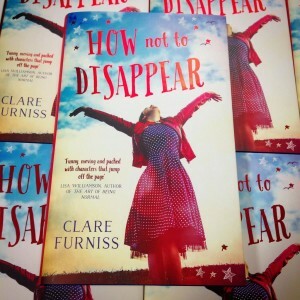 Clare Furniss | How Not To Disappear is nearly here! How Not To Disappear is nearly here! It’s very exciting to be starting the new year with a new book again! Last year it was The Year of The Rat paperback, this year it’s my brand new novel How Not To Disappear. Second books have a reputation for being tricky – like the notorious ‘Difficult Second Album’ bands talk about. You have deadlines to meet, expectations, different pressures and all of this can push creativity into the background. It’s hard to give yourself the time and space you need to find your story and allow it to take you where it wants to go. How Not To Disappear tells the story of an unlikely road trip undertaken by a pregnant teenager, Hattie, and her great aunt Gloria who is in the early stages of dementia. There were times when I thought the three of us might never reach the end of the journey… but we did! Copies of the finished book arrived at the Simon and Schuster offices this week and are looking truly beautiful – a great way to start 2016.